At the end of last month's newsletter I mentioned that Bandit had had some health issues and in particular one worrying result from his blood tests, so I thought I'd tell you about his tests in case the information helps anyone who finds themselves in a similar position. 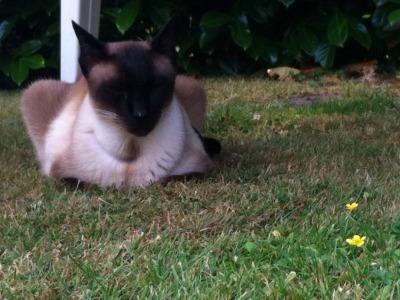 But first, here's a photo of Bandit taken this past weekend, enjoying a spell of sunshine in the garden. He was soooo sleepy, but trying very hard to stay awake to watch the birds! Bandit is now eleven or twelve. He's getting older and during his annual check-up in April our vet said she felt blood tests would be useful, especially as Bandit had lost some weight over the winter. Unfortunately, he's not an easy patient, hates going to the vet and detests needles! So it's impossible to take blood from him without some form of sedation. During his check-up the vet noticed that Bandit had a broken tooth that needed to come out, and she wanted to do a general dental clean as well. An anaesthetic was necessary and we agreed that blood tests should be done at the same time. All went well with the anaesthetic and dental work, but before she allowed me to take Bandit home the vet rang with the results of the blood tests, which were surprising and worrying because one of the values, ALT, was particularly high. ALT is a marker for liver damage, but you can't tell, just from this marker, what the cause of the damage might be. The vet said that, other than liver damage, a high level of ALT on its own (and it was the only level that was abnormal) could be an indicator of hyperthyroidism - an over-active thyroid gland. Further thyroid-specific tests were done to check Bandit's thyroid levels but these came back normal - even slightly on the low side. On the face of it, no thyroid problems, although thyroid levels can be masked by other disease processes going on in the body (in veterinary terms this is known as sick euthyroid syndrome) so these weren't 100% conclusive. The vet then recommended an ultrasound to check Bandit's liver and other internal organs, proposing that we redo the blood tests at the same time. She suggested waiting a few weeks to allow Bandit to recover from the anaesthetic and also allow the ALT levels time to either rise or drop, to give us additional information and possibly a better indication of what might be going on. In order to be able to carry out an ultrasound effectively, the abdominal area needs to be shaved to allow close contact between the ultrasound probe and the skin. An ultrasound isn't invasive and requires sedation rather than a full anaesthetic, so to be honest, I think it was the shaving that worried me most. The vet told me it would be necessary, but I didn't know how extensive it would be, or how it would affect Bandit. You can see his shaved patch in the photo above - a rectangular shape that covers the abdominal area between the fore and hind legs. From above, you can't tell that the patch is there. The photo was taken about a week after the ultrasound and it will take around six weeks for the fur to grow back. An ultrasound probe sends pulses of high-frequency sound waves through the abdominal area. When these waves hit boundaries between tissue areas (for example between soft tissue and fluid), some of the waves get reflected back to the probe, and the ultrasound machine then calculates the distance between the probe and the tissue boundaries. This allows a picture to be built up of the area being scanned, and a skilled technician is then able to 'read' the picture for abnormalities. Because it's all 'live', results are immediately available. The process doesn't take long, so about three hours after I dropped Bandit off the vet rang to say that I could collect him. As I mentioned above, he's not at all happy at the vets so I think they were rather glad to send him home! Happily, the ultrasound showed no problems with either Bandit's liver or any of his other internal organs although one or two of his intestinal lymph glands were slightly enlarged, indicating some form of inflammatory bowel disease. So we'll continue to monitor this. We had to wait a little while longer for the results of the blood tests because the blood was sent off to a laboratory for analysis, but the vet rang the following day to let me know that while the ALT level was still high, it was lower than it had been in the original tests. We'll continue to monitor this, too, in the months to come. If your cat needs to have blood tests and you'd like help deciphering the results, this page from the All Feline Hospital in Lincoln, Nebraska may help. Understanding Your Cat's Blood Work is a useful resource and there's also a link on that page to a downloadable PDF. It's not totally comprehensive (it didn't tell me everything there was to know about ALT, for example) but it's a helpful starting point. All the above books are available on Amazon and the links will give you further information about them. 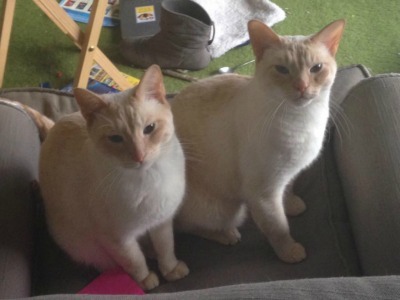 Our Meezers of the Month are Tybalt and Mercutio, named after characters in Shakespeare's Romeo and Juliet. They belong to Julie Howland, who first sent us their story two years ago, when they were kittens. They're all grown up now! You can read all about them, and their companion Van Gogh, on their own page here. "Cats and boxes! 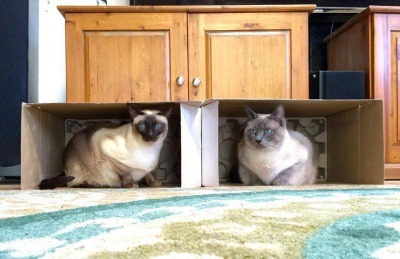 Here's Simon (left) & Sophie each in their own box. We had one box out and of course, they both wanted it and wouldn't share ... so had to get another box! Sophie is pleased but Simon still just wanted the only box all to himself!" That's it from us for this month. Bandit is doing well and he even put on a little weight between his first and second set of blood tests, which to me means that his digestive system is improving. Time will tell, and more tests will need to be done in six months time, but for the moment, he seems healthy enough. Wishing you a very happy July - we'll be back again towards the end of it!